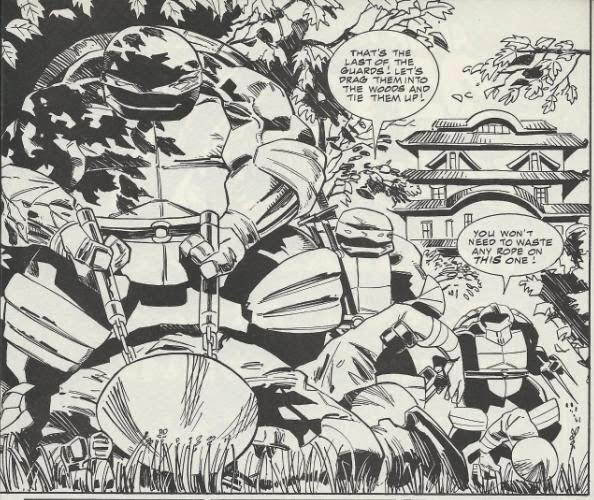 Outside Lord Komodo’s castle, Leo, Raph and Mike are making short work of the guards (though Leo and Raph naturally argue over subduing vs. killing). Snooping around, they eventually spot Master Splinter…having tea with Dragonlord Komodo. Inside, Komodo regrets that Splinter must be executed as he knows too much. Komodo plans on regaining his ancestral position as Emperor of Japan and his armies all over the globe stand ready for the take-over…which cannot take place until he cures his diseased Bushido spirit. Splinter then collapses thanks to some drugged tea and Komodo has him hauled off to the lab for further processing. In the cornfield not far away, Don is trying to cope with his new cyborg body. 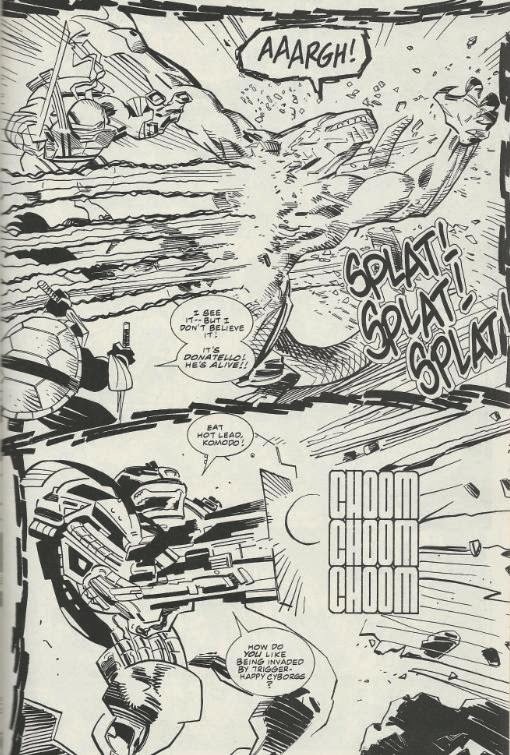 Mako recovers from the laser blast he took and hightails it out of there, while Donny is besieged by the angry consciousness of the cyborg armor’s previous user. Don recalls that after he and the cyborg fell from the helicopter and splattered on the street, the cyborg armor crawled over to Don’s dying body and merged with it. Realizing that the consciousness talking to him is nothing more than an old memory file, Don deletes it and takes full control of the armor. He then trudges slowly toward Komodo’s castle for some revenge. In the lab, Dr. Wu prepares a syringe of mutagen to inject into Splinter. Pimiko stops him, much to Lord Komodo’s annoyance, as she has some questions. Pimiko reveals that she is the daughter of none other than Oroku Saki: The Shredder. She claims that her mother fled from Saki before she was born and that Komodo gave them refuge. Pimiko wishes to know if it is true that the Hamato Yoshi “clan” are responsible for her father’s death. Splinter takes responsibility and Pimiko demands the right to face him in combat; a request Lord Komodo refuses. As Dr. Wu prepares to inject Splinter with the mutagen, Leo, Raph and Mike burst in through the skylight and attack. Dr. Wu begins injecting Splinter, but Pimiko stabs him in the torso and tosses him away before he can finish (inadvertently causing him to inject the remainder of the mutagen into one of the Dragonlord’s pet Komodo dragons). As the Kunoichi, who are loyal only to the Dragonlord, attack, Pimiko offers to help the Turtles and Splinter escape, citing that she will no longer serve Komodo. Raph helps the woozy Splinter down into a secret tunnel and rejoins the fracas. Suddenly, the Komodo dragon mutates and attacks. Things are looking bad until, out of the blue, Donnie arrives and blasts the mutated Komodo dragon away. The Turtles are thrilled to see that their brother is alive, but the reunion will have to wait; the Dragonlord has initiated the castle’s self-destruct. The Turtles flee into the tunnel, but Pimiko stays behind, saying that she must try to help the injured Kunoichi that the Dragonlord left behind. 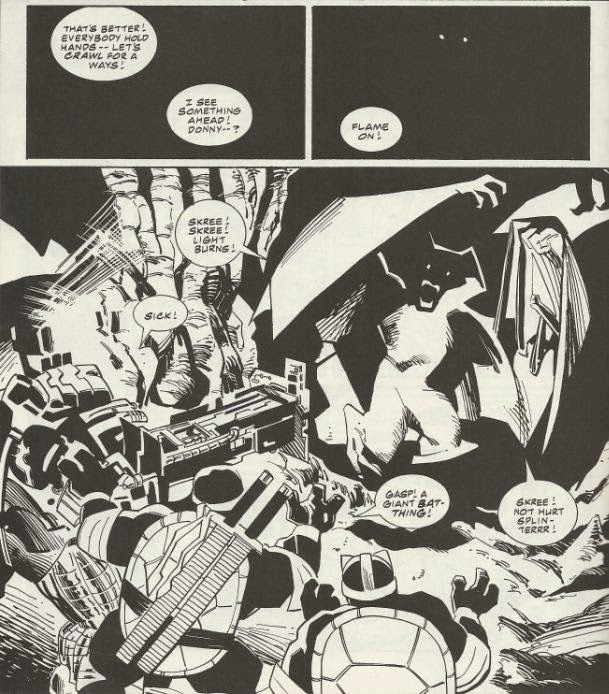 The tunnel leads into a cave where the Turtles are besieged by a swarm of bats… and one really, really big bat. They realize that the bat is Splinter, transformed by the mutagen into a mindless beast, and give chase. He escapes into the night and the Turtles fly off in the Triceraton aircar just as the castle explodes. They decide to head back to the lair and hope Splinter returns there once he’s come to his senses. Donnie, though, is a little irked that his brothers have yet to ask what’s happened to him. 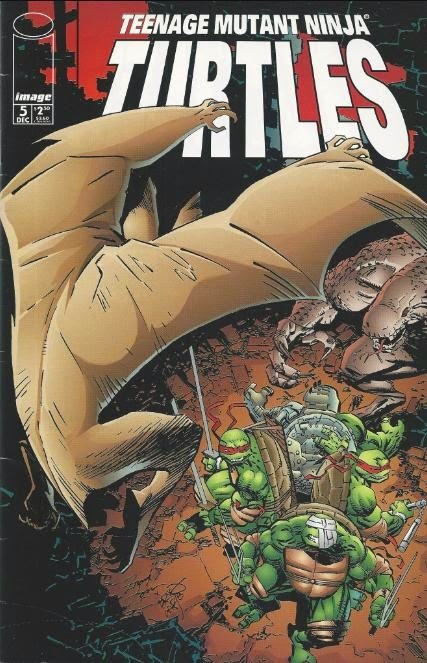 *This issue follows TMNT (Vol. 3) #4. The story continues in TMNT (Vol. 3) #6. *Don and the cyborg took their tumble out of the helicopter in TMNT (Vol. 3) #1. *The mutated komodo dragon will return in TMNT (Vol. 3) #17. *Pimiko will return in TMNT (Vol. 3) #18. And the first story arc of Carlson’s Ninja Turtles series comes to a close. This arc introduced a lot of interesting ideas and characters, and really whet my appetite for more, but as my previous reviews have made clear, I took some exception to the execution. This issue reunites the brothers for the first time since the series began and is, in fact, the first time we get to see all four Turtles fighting side by side (now that Donny’s back). It’s a rushed reunion and even Carlson seemed to be aware of that fact, as Donny makes light of it in the last panel of the comic. Still, it’s comforting to finally have them all back together, even if now we have to worry about Splinter being on the lam. The Dragonlord is still going to take a while to really build himself up as a remarkable villain. Where things stand right now, he still feels like he stepped out of the Fred Wolf cartoon; a generic overlord character who wants the mutagen so he can take over Japan and then the world, mua ha ha ha. Pimiko, on the other hand, really stole the show with the bomb she dropped. Daughter of Oroku Saki, huh? She’s still a victim of the 90s “bad girl” trend, but at least now she’s finally interesting. I’ve said it before, but I’ll just drive the point home here: the first arc of Image’s TMNT series was my least favorite. However, the book spikes upward in quality after this point, so it’s worth sticking to even if you didn’t like these first five issues. The story may be fairly bland and paint-by-numbers, but it’s the threads that it sets up for future arcs that matter.